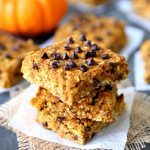 Oatmeal Pumpkin Bars – Thick chewy oatmeal bars loaded with pumpkin flavor. Sweet enough for dessert and perfect with your morning coffee. A must-make fall treat! Preheat oven to 350 degrees. Spray 9×9 baking dish with cooking spray or line with parchment paper. Combine oats, flour, pumpkin pie spice, baking soda, baking powder, and salt in large bowl. Add pumpkin puree, honey, vanilla extract and apple sauce to medium bowl. Whisk together until combined. Slowly add wet ingredients to dry ingredients. Fold in chocolate chips. Add oatmeal mixture to prepared baking dish and bake for 20-25 minutes or until toothpick test comes out clean. Optional – Sprinkle extra chocolate chips over bars after removing from oven. Bars can be made ahead of time. Refrigerate after baking if not serving right away. These taste best warm. Heat in microwave for 25 seconds before serving.